Killingworth CT Propane Delivery Services. Great Prices, Fast & Trusted Fuel Delivery. 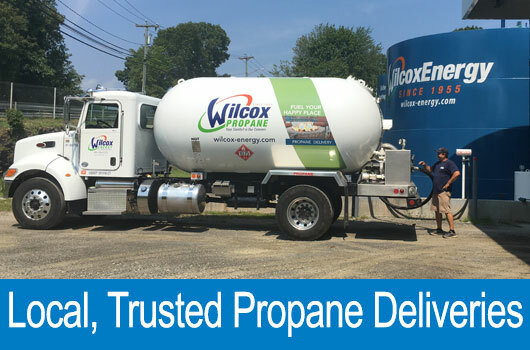 Wilcox Energy is proud to offer propane delivery services to residential and commercial properties right here in Killingworth, Connecticut. We are not a propane company, we are a customer service company. Our focus is all about our customers! Whenever your propane tank is getting low, be sure to schedule a routine propane delivery with Wilcox Energy. We also offer emergency deliveries for those unexpected moments when you realize that your tank is so low that you won’t make it through the night. Regardless of what type of delivery you need, they are all affordably priced. When you need a propane tank installation, the experts at Wilcox Energy can install it for you to ensure your safety. We service homes and businesses in the Killingworth, CT 06498 area. Let our affordable and high quality services keep you warm and comfortable during the cold winter. When you do happen to realize that the levels in your propane tank are extremely low, then you will need a reliable and fast propane delivery service. Not all propane suppliers can offer a fast delivery, especially in the middle of the winter. For a trusted and fast propane delivery in Killingworth, CT, be sure to contact Wilcox Energy. Your satisfaction is important to us. Many homeowners and business owners have gotten frustrated with the fact that when they need propane, there are many suppliers who are low on supplies. This is especially true when demand is high in the middle of the cold season. We prevent our customers from having to deal with such circumstances because we have a propane storage depot. This ensures that we always have adequate supplies to meet all of our customer's needs. Not only that, but our service area is small and very close to our main office. We also have service locations directly in Killingworth, CT. We can get to you quickly before you completely run out of propane. You will not have to deal with a cold house or long wait times for your propane delivery in Killingworth, CT.
At Wilcox Energy, we try to stand out from any other propane suppliers. We are located in the Southern Shores of Connecticut which makes us conveniently located. As mentioned above, we have service locations in Killingworth. In fact, many of our Killingworth customers have appreciated our close location. It means that we provide fast Propane Deliveries and Home Heating Oil Deliveries time frame. No one should have to deal with a cold home. Life gets busy and we understand that checking your propane tank levels, at times, is the last thing on your mind. For those who happen to have forgotten, we offer fast and affordable 24 Hour Emergency Service. Not only do we try to prevent any of our customers from dealing with long wait times for fuel delivery, but we can also service their heating systems. We have NATE certified contractors who offer a variety of HVAC services. They include repairs, professional inspections, and installations. Also, for those who use propane as their source of heat, our experts can service their hot water heating systems, propane fireplaces, and pool heating systems. We know that Connecticut propane users also have air conditioning requirements. Our NATE certified HVAC contractors can address any of your air conditioning needs. If your AC system starts acting up during the hot weather, our contractors can get it up and running once again. Our goal is to thoroughly address your comfort needs. There are many propane delivery companies that deliver to Killingworth, CT. Some are better than others. One aspect of working with Wilcox Energy is that our staff is made up of the most knowledgeable, highly trained, and friendly professionals. We take pride in who we work with and we want you to enjoy working with us too. Be sure to contact us for any concerns that you may have with regards to your HVAC system or fuel related issues. Propane proves are known for fluctuating. It is because the price of propane is dependent on many factors including supply/demand, weather, crude oil, and more. When shopping for the best propane prices in Killingworth CT, be sure to call the number below. Wilcox Energy has built their business principles on trustworthiness and honest prices. Therefore, we will always offer you the best propane prices around. To get today’s best prices, call (860) 399-6218. Killingworth, Connecticut, is a rural town in Connecticut located in Middlesex County. Originally named Kenilworth after the English town, Killingworth became the name during the American colonial period over time. Killingworth is the birthplace of Yale University founder Reverend Abraham Pierson. In 1999, the largest tree ever featured in Rockefeller Center’s Christmas display was taken from Killingworth, and stood at 100 feet tall. Killingworth is home to many famous people including Hall of Fame baseball player Jeff Bagwell, and Jonathan Bush, President George H.W. Bush’s brother. Home to just over 6,500 residents, Killingworth boasts a median household income that is more than double to what the national average is at $114,000. The average home value in this historic town is $398,790, which compared to 15 years ago, was $230,500. Killingworth, similar to other towns located next to it like Guilford and Madison, have higher than average median resident ages. The median resident age is 46 years old. Killingworth was originally home to mostly farmers, but today features a wide variety of occupations, with mostly white collar jobs.